The color purple may not have a big role in your wardrobe or home décor, but in a garden, purple flowers are essential for adding depth, richness and three season interest. Photo by Clive Nichols, taken at Trentham Gardens, Staffordshire, England. In art and literature, purple is associated with royalty, spirituality, serenity and knowledge. Some people find that simply gazing on the color purple promotes feelings of inner peace and calm. Purple can be bold and dramatic or quiet and restful, depending on its value, tone and shade. Tulips Queen of Night and Violet Beauty. To accentuate the power of purple, you can pair it with its complementary color, yellow. 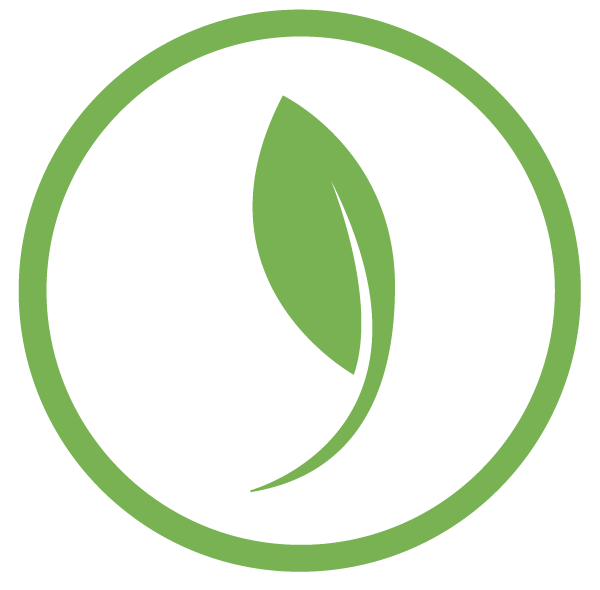 Complementary colors are located opposite each other on the color wheel. When positioned side-by-side, they practically vibrate with energy. In fact, the effect is so dramatic, that it’s usually best to reserve these pairings for accents rather than themes. 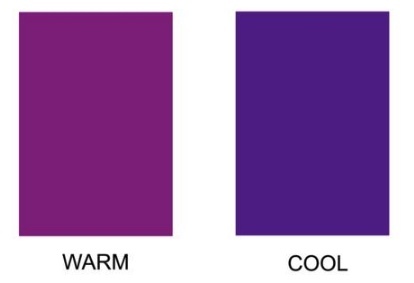 Color temperature is important when you’re working with purple – just as it is with pink. Learning how to navigate the full range of this beautiful hue is what makes designing with purple so fun. Purples that tilt toward blue are a cool, dark hue known as indigo or ultra violet. This color range is typically characterized as being subdued, peaceful, somber, soothing, sophisticated and contemplative. 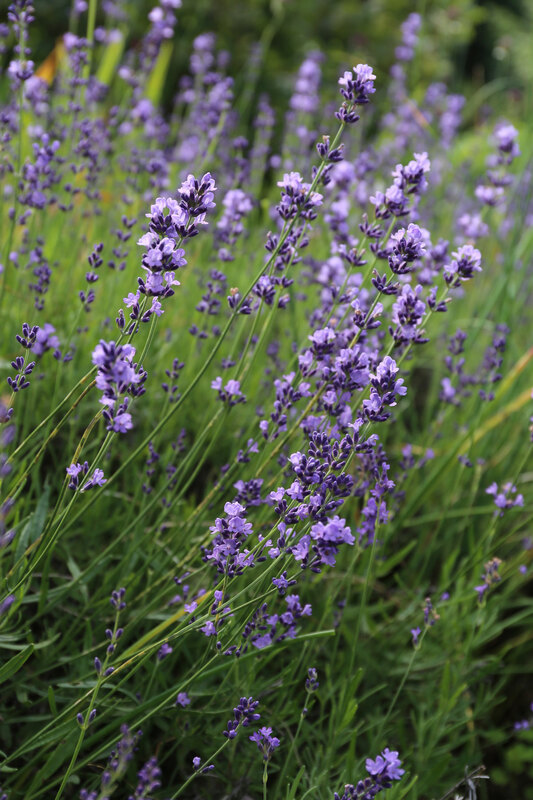 Plants with blue-purple flowers, add weight to a flower border. They are very useful for anchoring bright colors, as well as for separating and defining others. For maximum contrast, pair cool, blue-purples with their complementary color, orange. 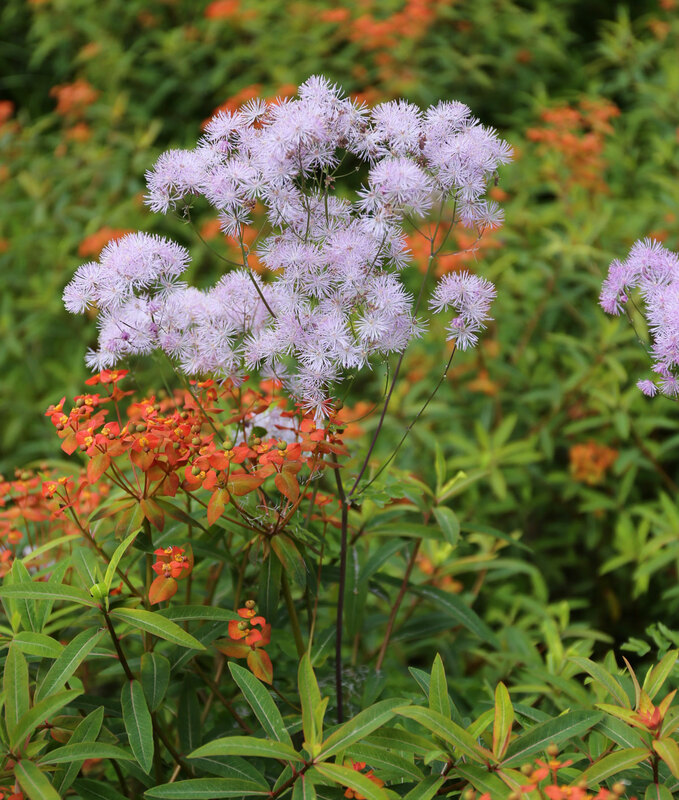 Lavender thalictrum with a red-orange euphorbia. When you look out across a garden, dark, blue-purple flowers seem to recede. This quality can be used to make spaces seem more expansive. Keep in mind that dark flowers with a low light value can get lost in the shade. To help set them off, provide a backdrop of contrasting foliage in hues of gold, lime or grey. Colors on the reddish side of purple are vibrant and energetic. In garden design, warm purple flowers are useful for adding drama and to bridge the gap between red and orange. Names for these colors include deep magenta, boysenberry and mauve, as well as the darker shades of maroon and plum. For maximum contrast, pair red-violet flowers with their complementary color, yellow-green, also known as chartreuse. Another way to incorporate warm purple hues is with foliage. Plants with “purple” foliage are usually more burgundy than purple, but they are invaluable for adding weight to a flower border and integrating the colors around them. Learn more about them here: How to Use Burgundy in Your Flower Garden. 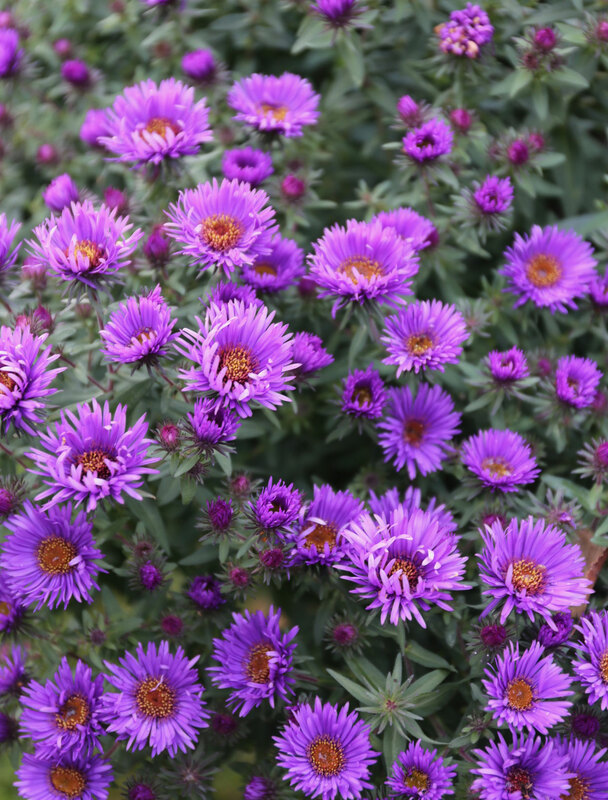 Combine purple flowers with different values of the same color. 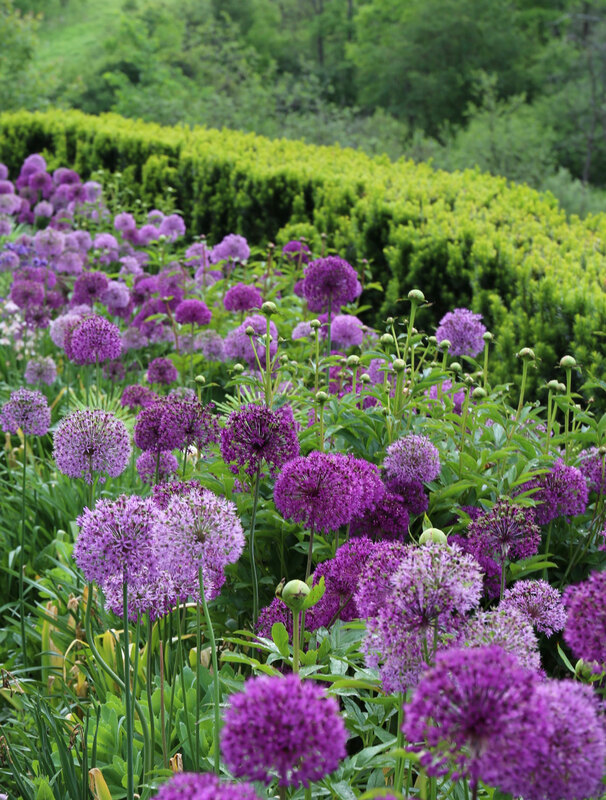 The alliums in the photo above are harmonious because they are light and dark versions of the same hue. 2. Combine different tints of purple. Tints are hues that have been softened by the addition of white. Lavender and lilac are good examples of purple tints. These soft colors usually work well together even when they have different color temperatures. 3. Combine purples with the same color value — meaning a similar lightness or darkness of color. The lupine shown above features a cool purple and a very warm purple, yet the colors harmonize because they have a similar value or intensity. 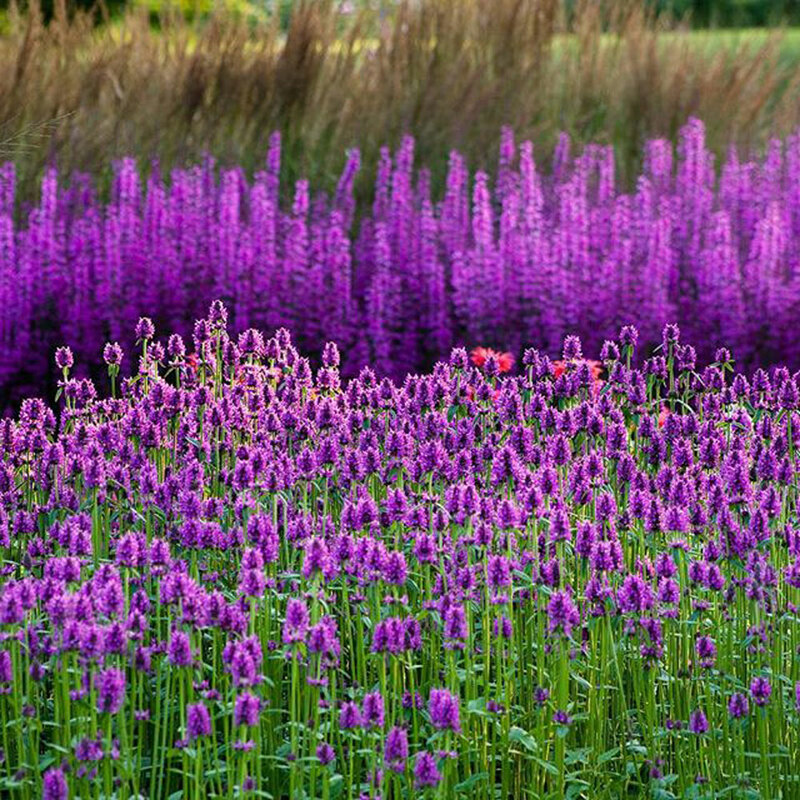 A striking planting that celebrates the magic of purple flowers. Marks Hall, Essex, England. Contemporary garden designers such as Piet Oudolf and Dan Pearson are known for using large blocks or “rivers” of color. Their designs often include plants with purple flowers. In garden design, purple flowers are very effective in helping to weave disparate colors together. Also, from a distance, mass plantings of purple flowers tend to merge into a pleasing purple haze. 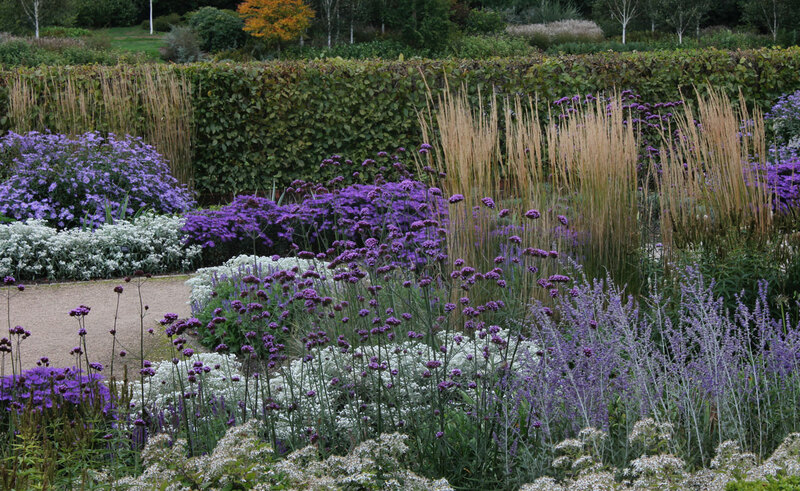 And at the tail end of the season, purple is a perfect companion for tawny ornamental grasses. 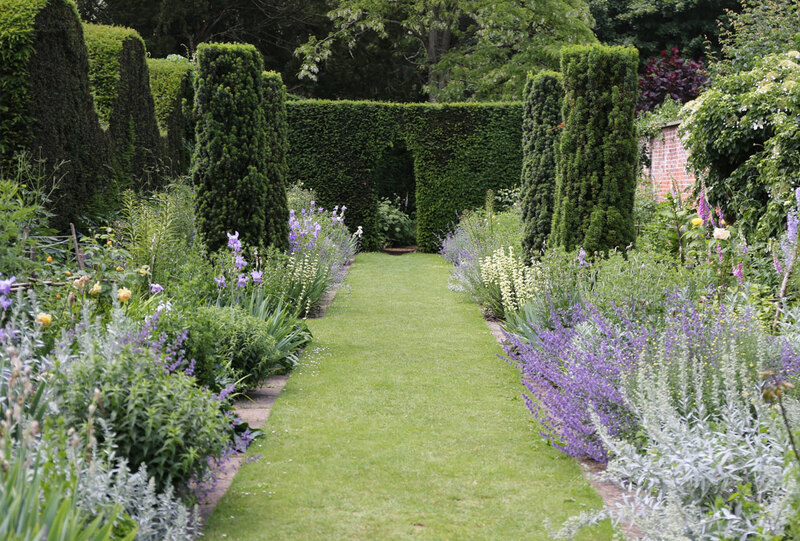 Wondering how to incorporate more purple in your own garden? Consider taking a seasonal approach. Create a month-by-month list of purple flowers so you’ll always have something purple coming into bloom. Or, strive for one very purple crescendo. 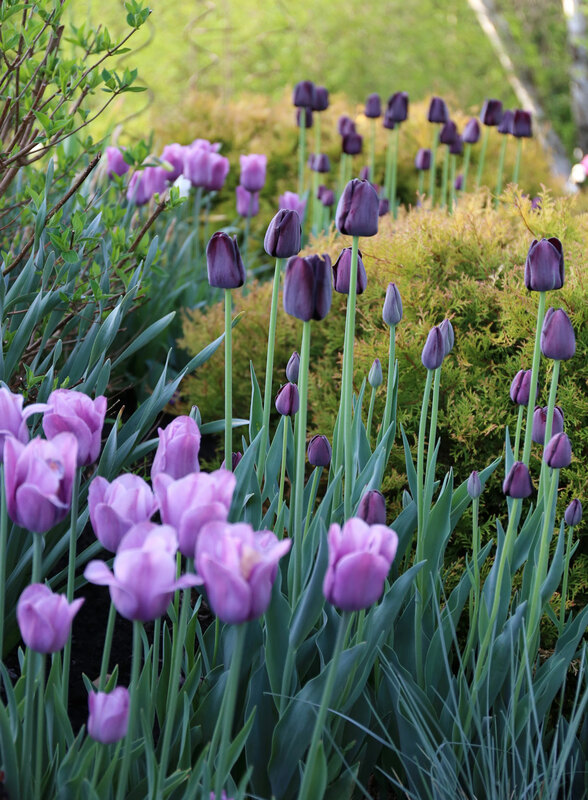 Spring, for example, offers a wealth of options, from purple crocuses and hyacinths to purple tulips and alliums. 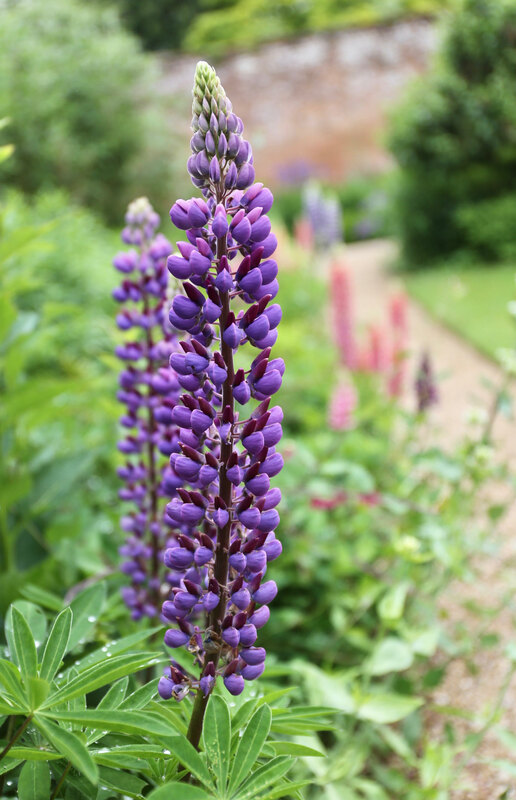 For early summer perennials you could consider lupines, baptisia, iris, clematis and campanula. For late summer purples, look to liatris, salvia, asters, phlox and Russian sage. 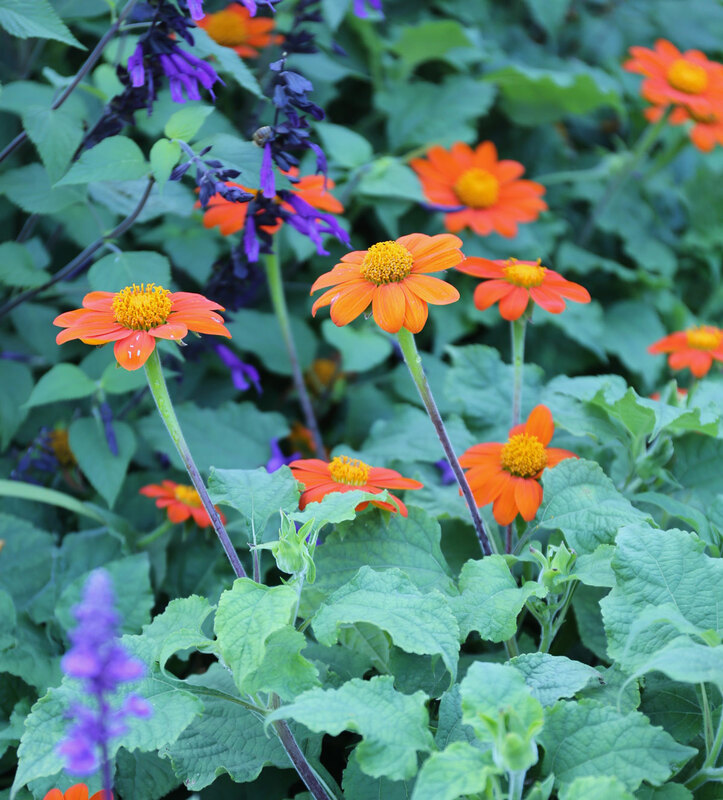 Opposites attract: salvia and tithonia. When designing a flower garden, it’s difficult to factor in all the elements of bloom time, height, texture and color. 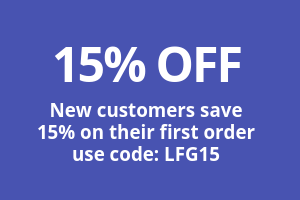 So start small and create a few effective combinations that you can build upon. It could be a harmonious collection of warm and cool purple tints or a bold pairing of complementary colors. 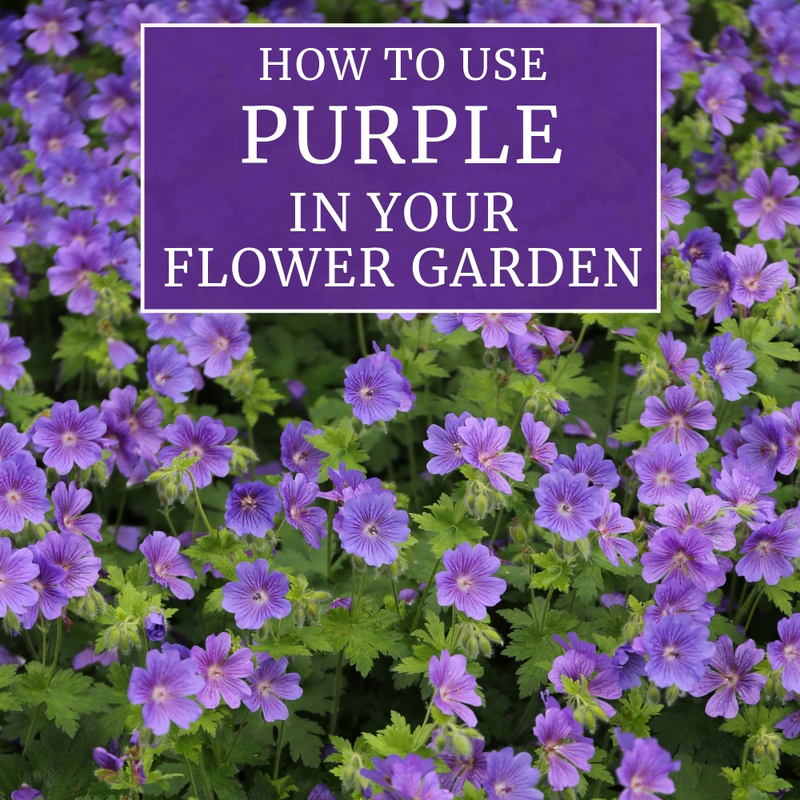 This is the best way to learn what sorts of purples appeal to you and work best with the other plants in your garden. To learn more about using color in your flower garden, read: How to Use Burgundy in Your Flower Garden, How to Use Orange in Your Flower Garden, How to Use Pink in Your Flower Garden, How to Use Red in Your Flower Garden and How to Use White in Your Flower Garden.